In the 14 year period* (2004 – 2018), a $100,000 investment in the IFR portfolio outperformed “The Market” (S&P500) by $108,000. The Guggenheim S&P500 balanced portfolio (RSP) inception date was 10/1/2003. In order to compare equities, the start dates must be the same; hence the start date of 01/01/2004. These three funds combine to completely cover the traditionally, high performance sectors. Read on. Why Small Cap Value (IJS)? A large and growing body of academic research suggests there are market anomalies that can be exploited. Some of that research has been recognized with Nobels in economic science — William F. Sharpe in 1990 and Eugene F. Fama in 2013. One of these findings is that value outperforms growth, rewarding those who identify stocks with lower price-earnings ratios and lower market capitalization. “Value” stocks have consistently outperformed their opposite “Growth” category over all time periods. In particular, Small Cap Value stocks have significantly outperformed other investment categories since 1929. Look at the table below. Small Cap Value outperformed the S&P500 by nearly 5% on an annualized basis over an 83 year period. That is food for thought… and action! 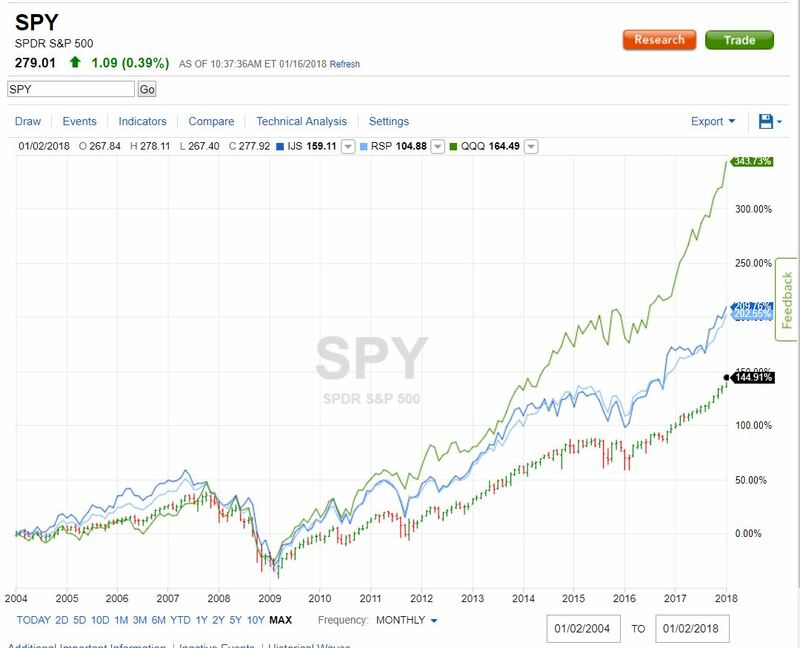 The green-red line represents the S&P 500, the light blue line represents iShare’s S&P Small Cap Value fund (IJS) performance over the same time period. There are many funds that track small cap value funds. Here’s a diagram that shows the top four funds – IJS is significantly superior to the other funds. For even more evidence of the superiority of IJS, click HERE. First, What is the ‘Nasdaq’? A global electronic marketplace for buying and selling securities, as well as the benchmark index for U.S. technology stocks. Nasdaq was created by the National Association of Securities Dealers (NASD) to enable investors to trade securities on a computerized, speedy and transparent system, and commenced operations on February 8, 1971. The term “Nasdaq” is also used to refer to the Nasdaq Composite (ONEQ), an index of more than 3,000 stocks listed on the Nasdaq exchange that includes the world’s foremost technology and biotech giants such as Apple, Google, Microsoft, Oracle, Amazon, Intel and Amgen. 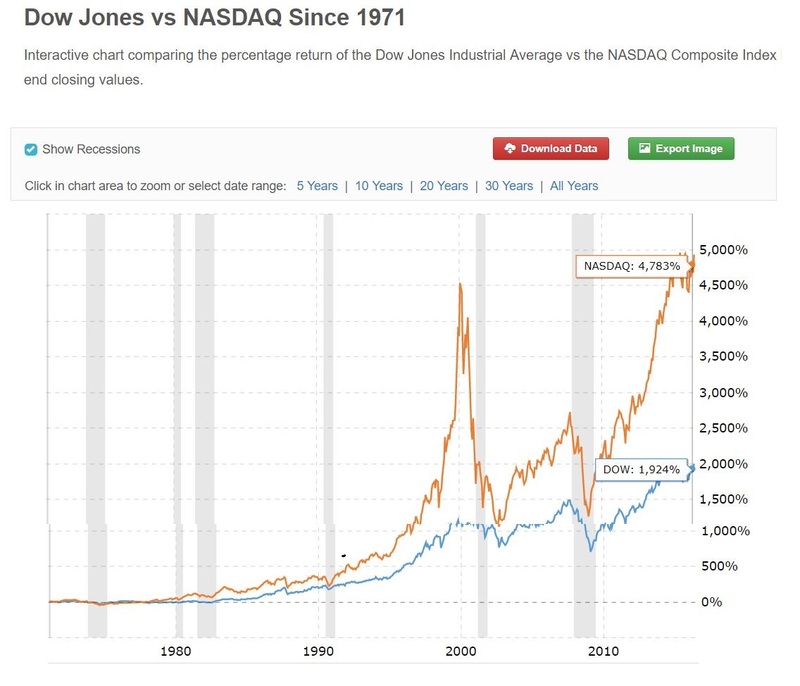 Second, How Has Nasdaq Done Vis-a-Vis Dow Jones? 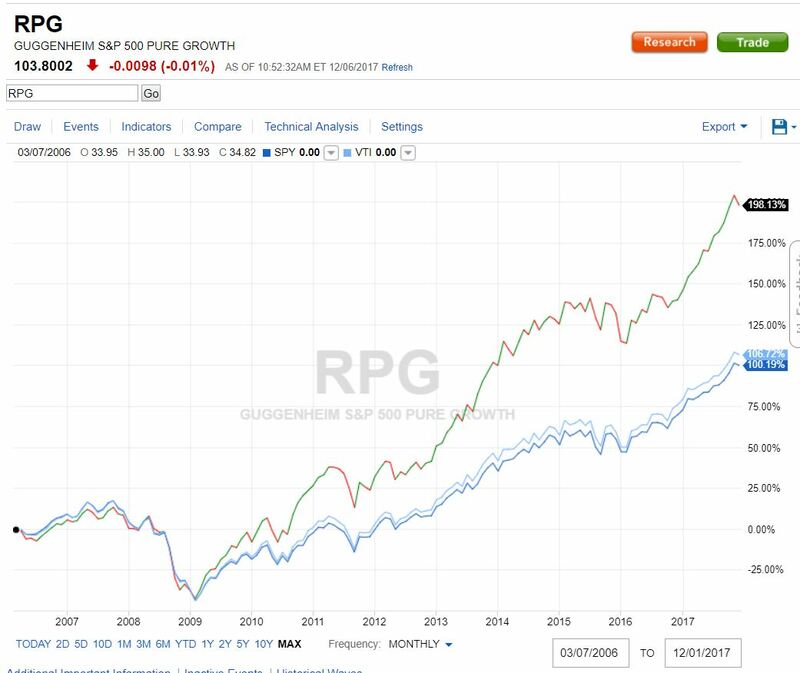 Why Guggenheim S&P500 Equal Weight (RSP)? 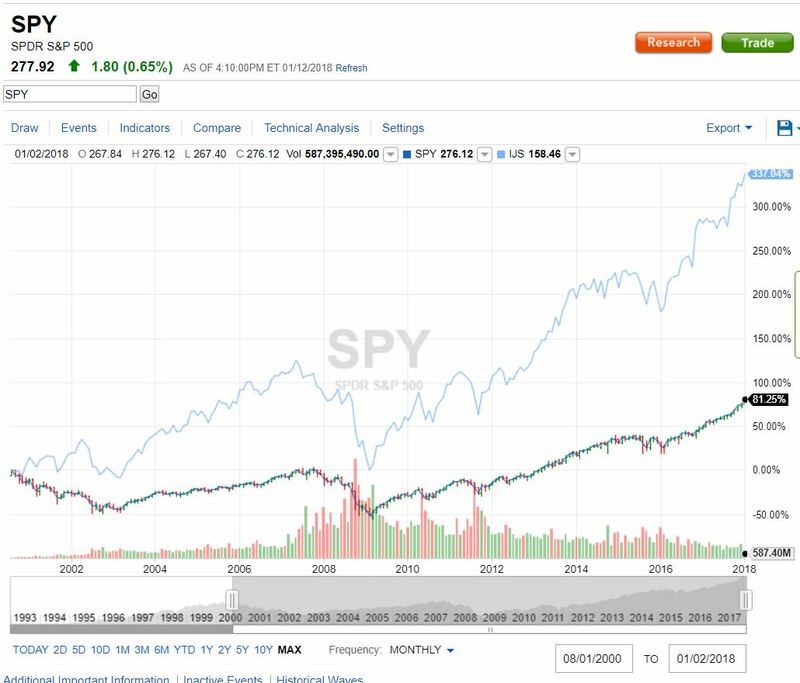 because it has significantly outperformed its parent, the S&P500. What is the Guggenheim S&P500 Equal Weight? 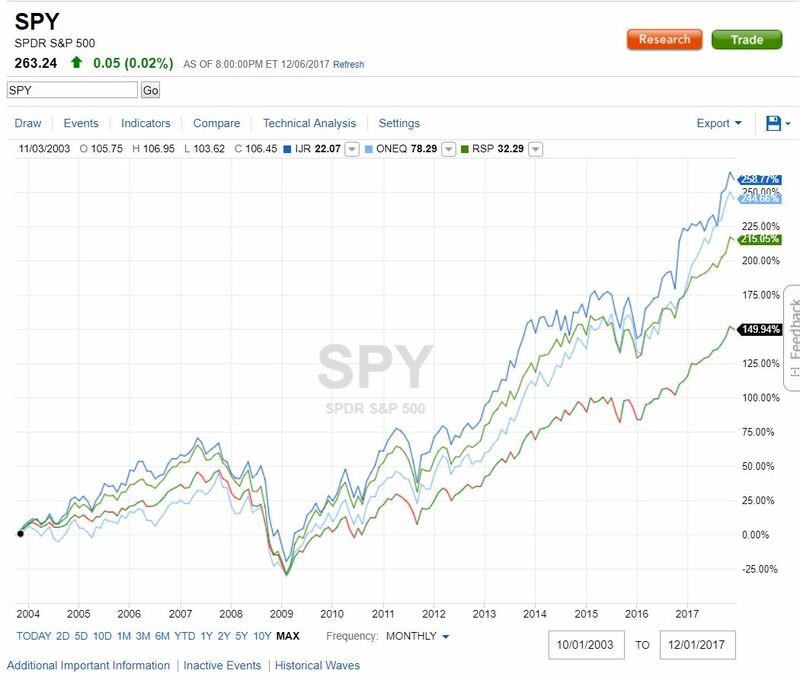 In the S&P 500® Equal Weight Index, each of the 500 stocks that make up the index are “equally weighted.” This is in contrast to the standard S&P500 (SPY) where each component stock is weighted according to its total market capitalization. For example, Apple, Microsoft and Amazon account for over 8.5% of the value of the standard S&P500. In contrast, the same three companies account for only 0.6% (100% divided by 500 companies = 0.2% times 3 companies = 0.6%) of the value of the S&P500 equal weight. How Has The Guggenheim Performed vis-a-vis the S&P500 (SPY)? As you can see, the equally weighted S&P500 has outperformed its parent, the market cap weighted S&P500, by a 2-1 ratio! How Likely Is This To Continue? But even if the outperformance should not be as pronounced in the future, you will probably still meet or exceed the performance of the S&P500 – there’s a lot of distance between them. While it is much simpler to merely invest in the S&P500 the improvement in expected average annual returns (17% vs 11%) is worth the extra effort.